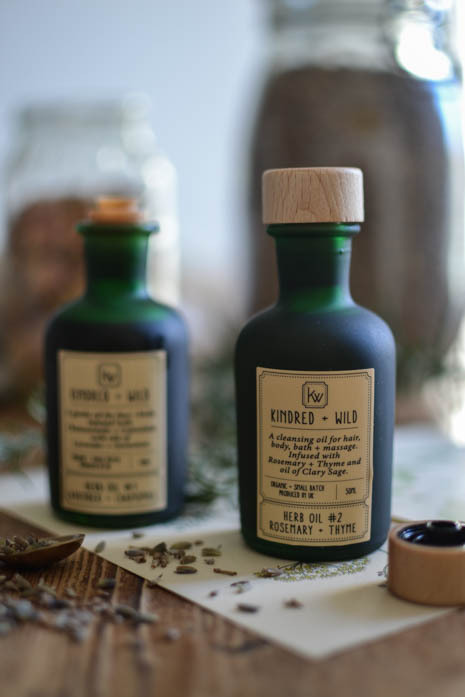 When Mugdha Sapte, the inspirational woman behind the botanical apothecary company Kindred + Wild got in touch with me to tell me about her brand, I knew straightaway that we were going to have a lot in common. Like me, Mugdha has a deep love of nature and its many mysteries, and a few years ago she decided to harness her knowledge of the natural properties of plants to create Kindred + Wild, a range of botanical oils and balms based entirely in natural ingredients. I asked her if she would share the story behind her beautiful brand with me. I grew up in Mumbai and spent a lot of time during my teenage years learning about natural and traditional remedies and treatments for my hair and skin, experimenting with herb masks and discovering Ayurveda practices. I developed a passion for harnessing the properties of plants and natural substances that stayed with me as I grew older. After studying design, fashion and display in university, I moved to the UK in 2005 where I began working in retail, focusing on interiors and homewares. I have always loved craft and making things with my hands and a few years ago I started experimenting with natural dyes, foraging for plants and teaching myself how to identify and use them. I currently work part time as a freelance product stylist at the same time as developing Kindred + Wild. How did Kindred + Wild come about? About three years ago, I found myself at a particularly low point in my life, and I started asking myself where my life was going, and what I really wanted. I realised two things: that I was passionate about plants, and that I wanted to work for myself. At the same time as that was happening, I was having problems with my skin, and so I started cutting out lots of the chemicals that I had previously been using on my skin and hair. I started thinking about using simple, natural remedies instead. I already knew quite a lot about plants and their healing properties, but I started researching the teachings of Ayurveda, herbalism and aromatherapy, thinking about the remedies that people used long before the invention of modern chemicals. Eventually this led me to create natural skincare remedies for my own use. I experimented a lot and took it very slowly until I was happy with the products. I suddenly realised that I had discovered an opportunity to combine my love of nature with something that I really believed in. And thus Kindred + Wild was born! What can we expect to find in the Kindred + Wild range? 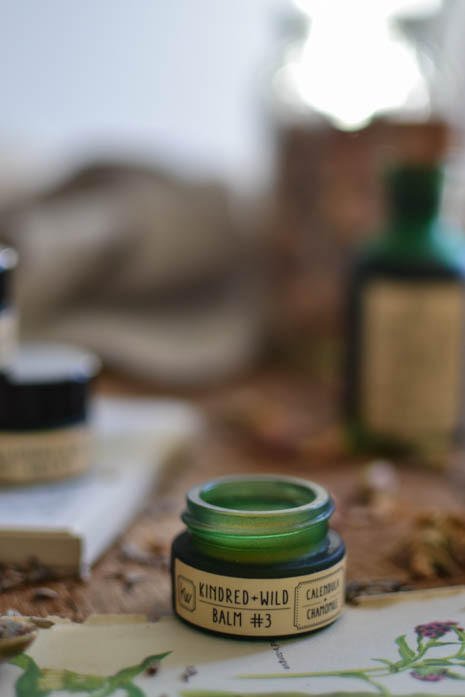 The range is made up of six products (three botanical oils and three balms), the basis of which are actually very humble herbs and plants like Rosemary, Thyme, Violet, Yarrow, Chamomile and Rose. These can all be easily found in gardens all over the UK, but very few people are aware of how beneficial their properties are. One of the things I love about the range is that for our everyday care, we need not look much further than our back garden! I have purposefully avoided being prescriptive in how I have labelled the products. This is because I want the products to be used as people see fit. Every herb and flower I've researched can be used for different purposes, and so the same goes for my products. For example, the oils can be used as facial, body, hair or massage oils and the balms are as good for moisturising lips as they are for treating cuts, grazes and dry skin. My approach to the range is holistic; the products are designed to have a remedial as well as cosmetic use. How would I decide between the different oils and balms? All the oils and balms are multi-use and so they can all be used for different purposes and alongside each other. However, for example, Herb Oil #1 (Lavender + Chamomile) is designed as an everyday cleanser and moisturiser, Herb Oil #2 (Rosemary + Thyme) is excellent as a hair oil and for massage, and Herb Oil #3 (Rose + Yarrow) is a heavier oil, good for the winter and for those with dry skin. Balm #1 (Lemon Balm + Lavender) is a good all round lip balm with antiseptic properties, Balm #2 (Violet + Yarrow) is great for treating minor scrapes, grazes and irritations, and Balm #3 (Calendula + Chamomile) is the gentlest balm, unscented and perfect for those with sensitive skin and babies. What makes Kindred + Wild different from other similar products? My starting point is always the plants and their properties, and I am committed to creating useful products that have multiple functions, so that people don't need hundreds of different skin and hair care products. The range is not just about cosmetic benefit, but has remedial value too - that is very important to me. The quality of my ingredients is key and so I only every use natural essential oils, and try to use organic products as far as I can. I make everything in small batches to ensure that the quality is of a very high standard. What are your future plans for Kindred + Wild? I am currently in my first year of trading, so I want to spread the word about Kindred + Wild and build connections with like-minded people. I am currently selling on my website, and am now also looking for stockists. I have plans to develop a hand cream at some point, and I would also love to add natural fragrances to the range, as I absolutely love working with fragrances. Oh and I would love to move out of my kitchen and into a proper workshop at some point! Thank you so much for taking the time to talk to me, Mugdha. I'm so inspired by the way that you turned a negative time in your life into an opportunity to create a wonderful business, and all the hard work and careful thought that you put into your products. In researching this post, I have been using the Lavender + Chamomile oil and Chamomile + Calendula balm almost every day for the last few weeks. I have been primarily using the oil on my face and hands before bed, and have been impressed by how soft my skin feels, but also how calming it is before falling asleep. The balm has become my go-to lip balm, and I've also used it on dry knuckles and little blemishes. It's very gentle and smells heavenly! As the above picture shows, the little green glass bottles and pots also look pretty gorgeous in my bathroom, which is just as important in my book! Kindred + Wild can be found here, and Mugdha is currently offering a 15% discount on all balms during March with the code "BALMAR17". This is a sponsored post in collaboration with Kindred + Wild, but all thoughts and opinions are 100% my own.